We had a few Playgro toys before we became toy testers, but I never really knew just how extensive their range was. I only really saw them at Coles and Big W before and didn't realise that they were also stocked at so many other places (including Target, Baby Bunting, Myer, Toys r Us and Bubs). Its been so awesome being a toy tester because I've got to try toys that I've never even seen in the shops before. 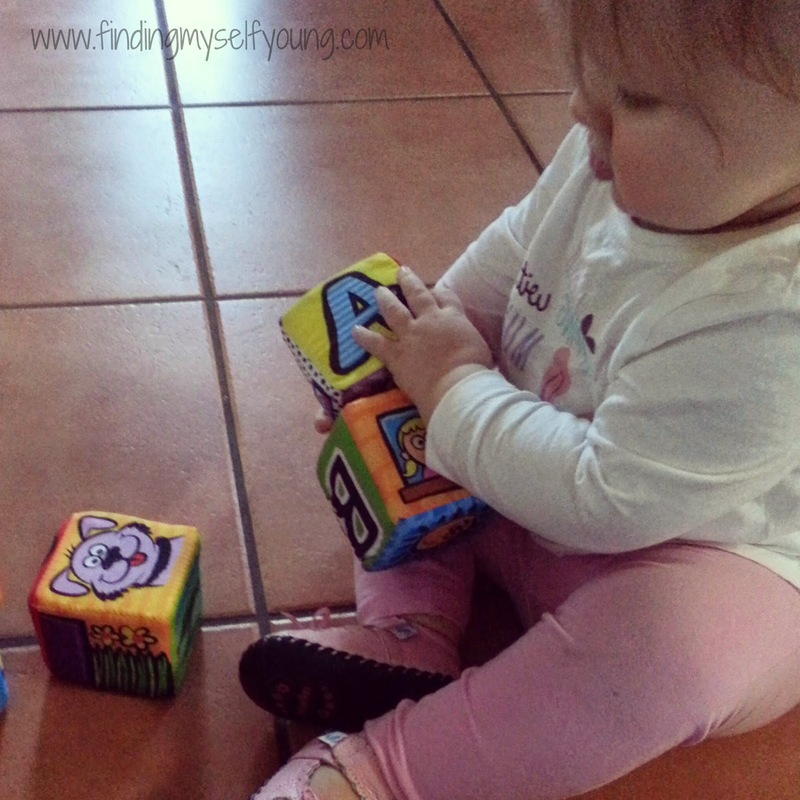 The latest one we've been trying is the My First House Blocks. Who doesn't love a set of soft blocks? They're like a right of passage for every child. I have to say these ones are uber cool. The blocks stack up into the shape of a house and have a cool house print on the front. They also have different prints on each side. There's numbers, letters, real animals, cartoon animals and black and white patterns (including a mirror). All are designed to visually stimulate bub. She seems to like the cartoon animals best. The blocks are a good size for babies to pick up and keep a hold of (they're also nice and soft for when she chews on them). She has no trouble holding onto them and is an expert at knocking them down. 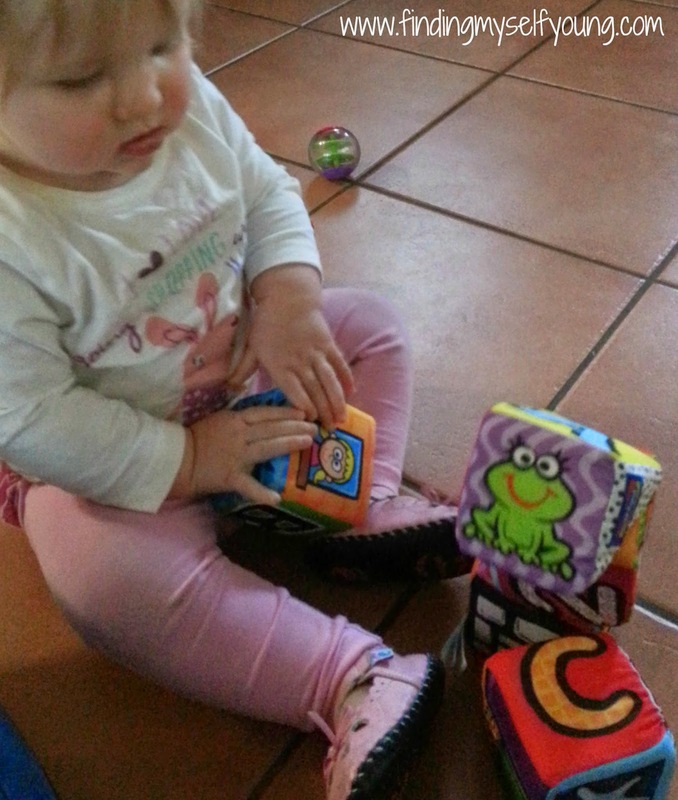 Shes not so much interested in stacking them as she is in picking them up and moving them around (or throwing them). She gets quite annoyed when I build them up in a stack in front of her and will pretty much immediately knock them down again (hence it was incredibly hard to get in focus photos for this review). I'm not sure whether shes just annoyed that I'm touching her blocks, or perhaps she thinks Im just doing it in the wrong order. I'm sure she'll inform me once she can talk properly. The prints of the blocks are nice a vibrant and eye catching. They include lots of different colours, patterns and shapes to attract and hold attention. 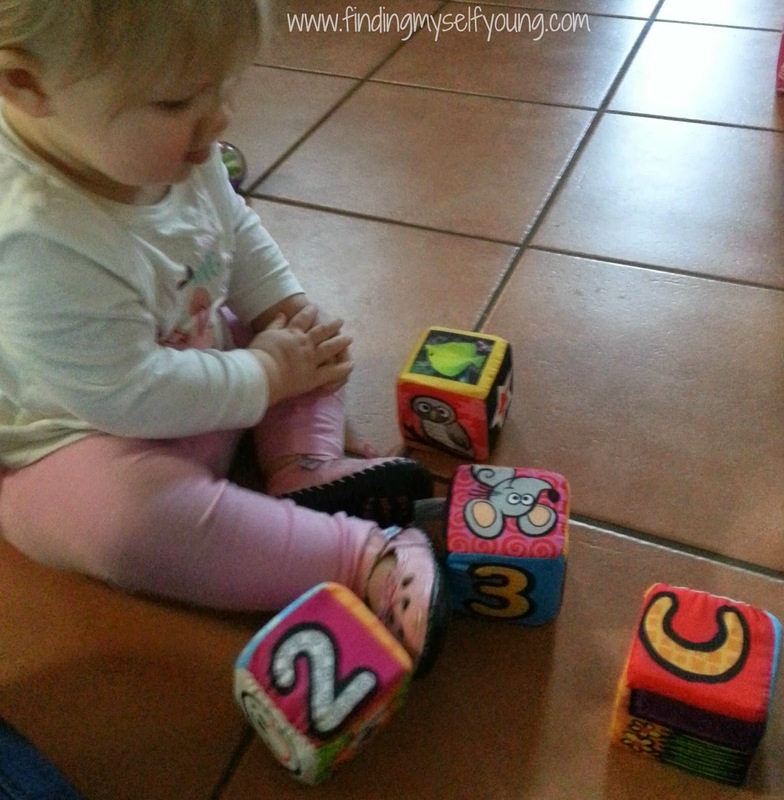 The blocks will continue to be useful as she gets older as I can use them to help teach her how to count, how to learn letters and how to name different animals. Such a great learning tool as well as a fun toy. They're guided for 6mths + and I think thats about right. At 6 months babies would probably only be picking them up and putting them back down but as they get older they will be able to use them for much more. I'd say we'll be using them until shes about 18 months old (hopefully by then she'll let me build stacks with her). I'd definitely recommend these blocks to other parents and they also have a set of Grip n Stack soft blocks for sensory play. 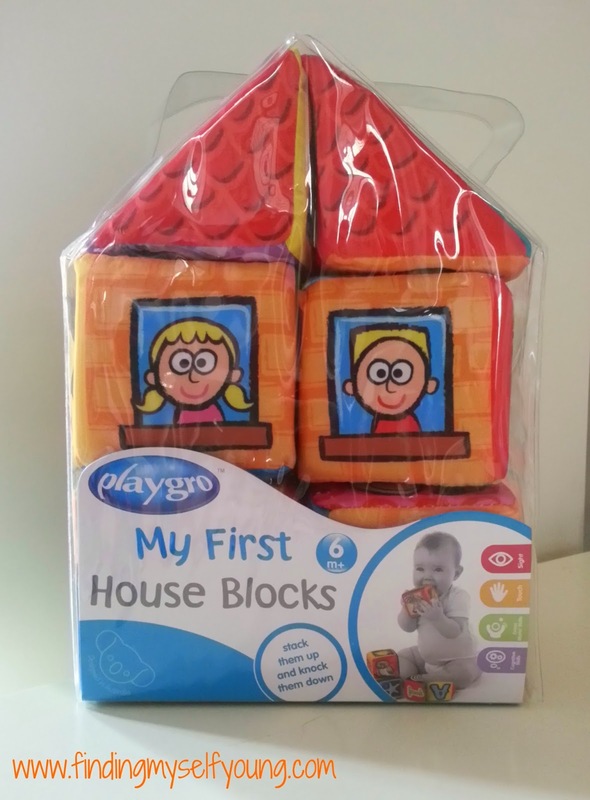 To purchase these blocks just email sales@playgro.com. The lovely people at Playgro have put together a great giveaway so that you can all join in the toy testing fun and try out a Playgro toy for yourselves. I'm excited to be able to offer 6 Twirly Trio's for six lucky Finding Myself Young readers to win. To enter all you have to do is follow the prompts in the rafflecopter widget below. If you know anyone who would love to win one feel free to let them know about the competition too. 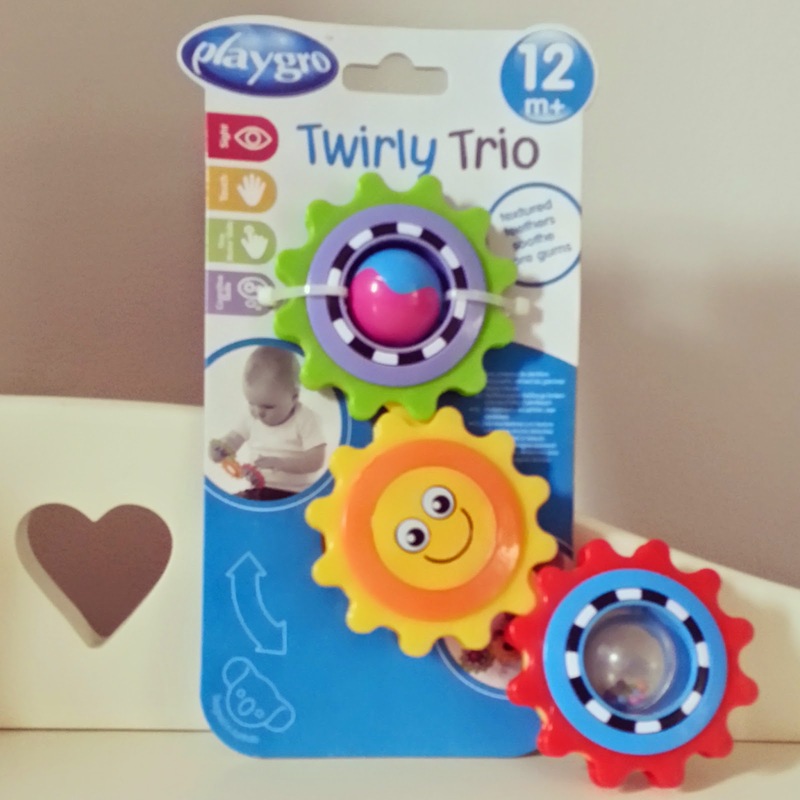 You can read my review of the Twirly Trio here. Linking up with Grace, Kaz and Bel. Entry is open to Australian residents, excluding ACT. Competition commences 6:00am 4th July 2014 and concludes 11:59pm 14th July 2014. This competition is a game of skill and will be judged as such. The 6 most creative answers to the blog post question as deemed so by Finding Myself Young and Playgro will be the winners. All mandatory options must be completed to constitute a valid entry. Winners must make contact within 48hrs or prize(s) will be redrawn. Prizes will be distributed directly from Playgro Australia and cannot be delivered to a PO Box. Finding Myself Young takes no responsibility for the prize delivery. This competition is in no way associated with, administered or endorsed by Facebook. I have so many pregnant friends at the moment the twirly trio would make an awesome present. It looks like a great toy for distracting my boy at nappy change time! I'm also totally intrigued by it, every picture of your daughter has it in a new configuration. I want to play with it!! Its a pretty cool toy. She absolutely loved it. Unfortunately we accidentally left ours behind at a restaurant when we had lunch the other day (didn't realise until a couple of hours later). I'm devastated because it was awesome for distracting at nappy change time! I have a bubba with very busy hands. 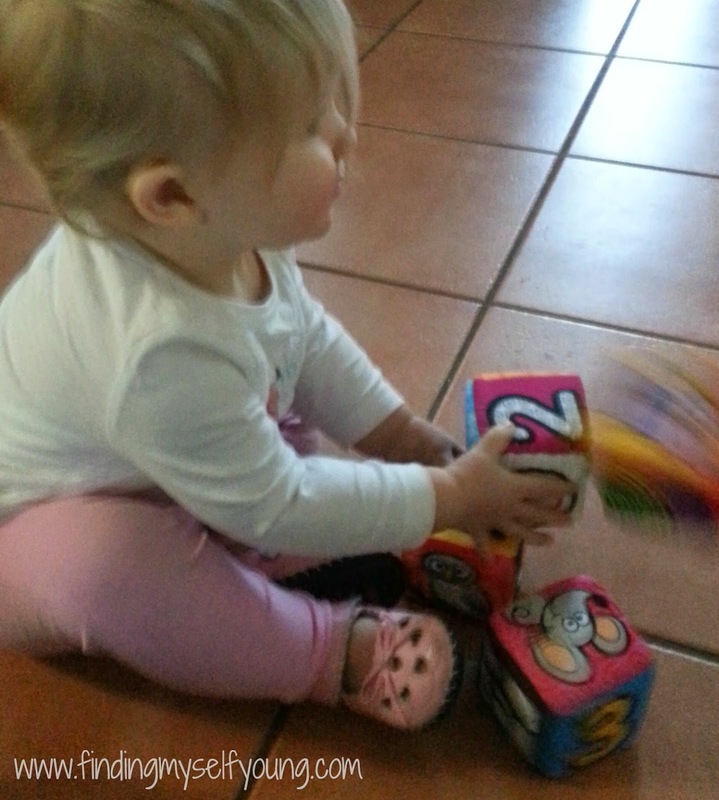 I can imagine in a few months she will love working on her fine motor skills with this cute toy. Anything for 5 minutes peace!! What a cute toy and great for boys and girls. Would love to win one to give to one of my pregnant friends. My kids are past these toys, I would still like to win so I can gift it to someone else. I remember you testing this toy and I thought it was great! My sister has been a career girl and finally in her forties is having a baby. Having no idea what's in store for her she's on the go slow to get organised. Only 6 weeks to go and she's not started the nursery, I've only just convinced her to buy the baby car seat - almost dragging her into the shop kicking and screaming. Thus the dilemma - I would love to be one of the lucky ones to receive this gorgeous baby prize. Because I can see it now - she'll be in hospital with the baby and I'll be out their panicking, buying all her goodies. This quality toy will be one less thing for me to have to grab - LOL!! Great colours to keep little minds interested and curious! All those colour would surely entice my little one to learn to reach out for things. sophie needs toys of her own, not ones she's inherited from the bigs! This toy would be perfect for my baby (and also for my 16 month old) because with past experience, they love toys that make sounds and are able to be moved and manipulated in their hands. I love it when they're at that discovery level giving everything a go. I have 2 girlfriends expecting in December. What a lovely surprise to give them something thats fun, interactive and educational for their little ones. The only problem they will have to share! I would love this bright and fun looking toy to keep my littlest man Callum occupied while changing his nappy. With a rattle, mirror and best of all its 3 gears which with his curious little mind will (hopefully) keep his hands on it and away from the poo which he unfortunately seems to love sticking his fingers in! I would love to win this toy for my bubba girl due in November. As she is a 'surprise' 3rd baby for us, we had previously cleared out all the baby toys and gear, so are starting all over from scratch again! I would give to my cousin who has just given birth to her first child, a baby boy named Riley. I haven't been to visit yet and want to make up a basket with a few items so this would be great! What a very clever toy that would engage my little boy. I often pop him into a bouncer when I'm in the shower so I can watch him, and am always looking for toys which will entertain him longer. (The longer he's entertained the longer I can have a peaceful shower. Win-win!) He'd also love the mirror and the sounds, and the gears would give him a new challenge. Aaahh- longer showers would be bliss! My little princess will turn one in two months. It would be great to win this as her 1st birthday gift. My girl has started to try to grab everything she's into, including her brother's toys, which are not for her age. I'm sure she would love this colourful and fun Twirly Trio. Playgro have some great toys dont they. 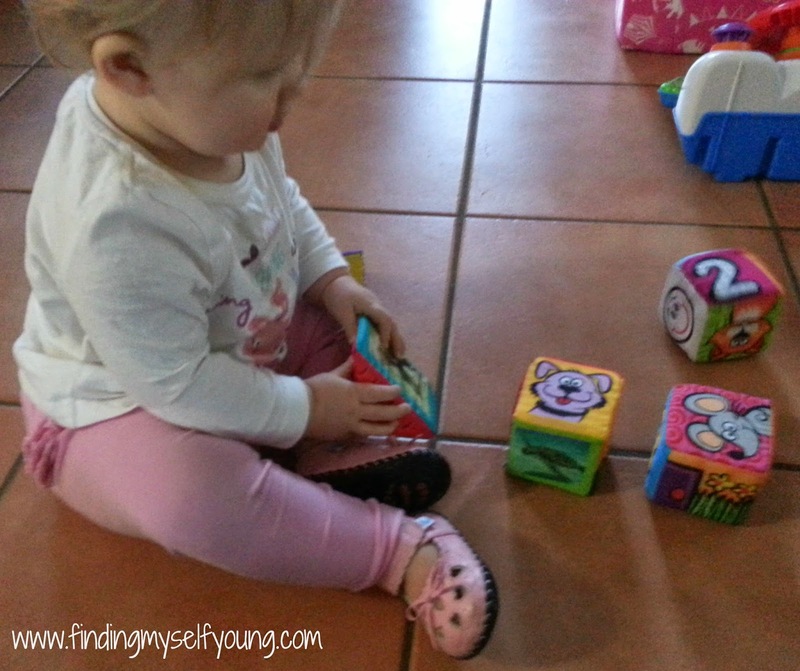 these blocks would be great if you have tiles or wood floors as blocks are so noisy on our wood floors. They'd be pretty easy to clean too which is another bonus. my best friend who has a beautiful little boy who would get so much joy out of this, rather than all his big sisters toys! i have a 4 month old son who is growing so fast with every blink i take! also a toddler who loves interacting with his baby brother, this is a great way for him to do so whilst both finding these toys interesting and fun! These are gorgous. 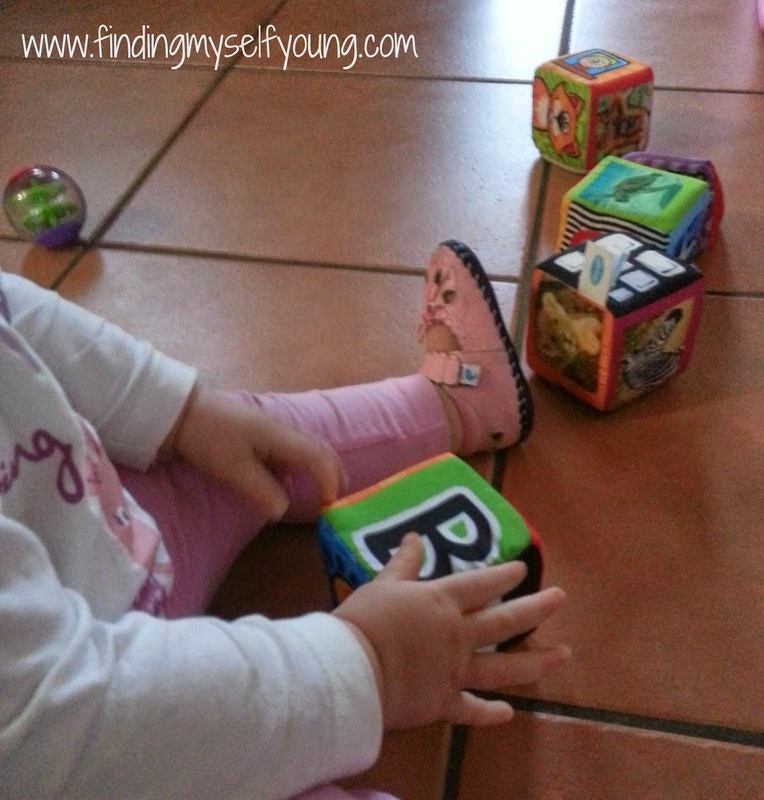 As a teacher I am always keen to have toys that are educational and beneficial to babies development! With a four month niece, these would be very handy very soon! Would love to win for my grandchildren. Becoming a aunt for the first time i want to spoil my little niece looks colourful and fun i know she will love it.